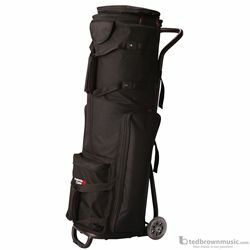 Drum Hardware Bag with Steel Frame & 100 Pound Capacity In-Line wheels. 300-Denier nylon drum hardware bag with 25mm steel construction. 100 pound capacity in-line steel wheels. Exterior accessory pockets and bag section is removable.